One thing you never seem to be told in amongst the millions of messages and opinions thrust upon you when you become a parent is the existence of parenting tribes. Sure, they're alluded to - The Earth Mother, The Helicopter Mother (noticing a theme yet?) but the examples given seem so ludicrous and outlandish that you dismiss them as yet another stick being used to beat you and your decisions. Then, slowly but surely, you do start meeting them. And it's weird because here they are doing the same thing as you but in a way that is wholly unrecognisable. But mostly you can avoid them because like follows like and you find your people. But the differences that you manage to avoid on a daily basis become very apparent should your child take up a hobby. Parents of kids with hobbies generally fall into two camps - the ones who think it's great they have an interest but sometimes resent the amount of time they can take up and the ones who devote their entire being to making sure that they are supporting their child to reach world glory. I'm in in the former tribe. I love that my child has a hobby - in this case, a 2012 legacy of swimming - that she loves and she wants to do well at but goodness, does it take up a lot of time. I cheer her on at races and I sort of know what her PB times are (that's personal bests. Hobbies open up a whole new language as well) but I couldn't tell you off the top of my head. I'm happy as long as she's happy but you can bet your life that if she ever got to the Olympics, I would be as happily weepy as Bert Le Clos. But a lot of the swimming parents - and here, I cannot restrict this generalisation to just mothers which frankly is a delight all on its own - are in the latter tribe. These parents show up to galas armed with clipboards and highlighted race sheets where they take note of not only their own child's times but those of other kids in the club or in rival clubs. I find it utterly bizarre because I don't care about other people's children. Not on this level anyway. But they find it bizarre that I don't know these things. And then there we are, judging each other even though we're essentially doing the same thing. I try incredibly hard not to judge them. Sometimes I envy them that they are so wholly devoted to their children and want them to do well. But... but... we do judge. They judge me because I'm busy reading my book because galas last for hours and my kid is in one race for a total of less than two minutes and I have so little free time so why wouldn't I take this time to catch up on something that I enjoy that's just for me? And I judge them because they're not reading or doing something for themselves. They're obsessing over times and the smallest fractions of seconds and for children that have nothing to do with them. 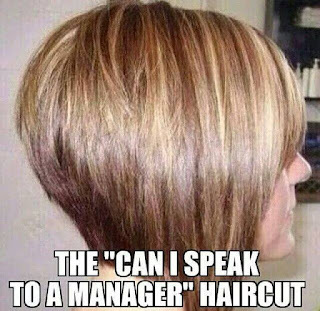 And SO MANY of the mums have Can I Speak To The Manager haircuts and... well, it doesn't matter who you are, I instinctively judge you for that.